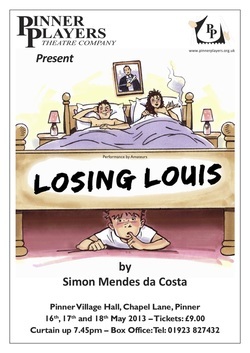 "Losing Louis is a clever, touching, modern comedy – a family reunion play. Set in Louis and Bobbie’s marital bedroom, the story shows how secrets are unearthed when their children, Tony and Reggie, plus their wives, Sheila and Elizabeth, come to the funeral of Louis, a widower whose philandering in the early sixties results in today’s tangled consequences. The play moves backwards and forwards in time between the 1960’s and the present day. Premiered in Hampstead in 2005, the production starred amongst others, Alison Steadman in the role of Sheila, the rather vulgar and indiscreet wife of Tony, with more than a hint of Beverly in Abigail’s Party!" "You can keep the f*cking clock!"